One year ago, I started a little blog to showcase photos that I took at the Disneyland Resort. Inspired by friends who had found success with their own online exploits and motivated by a beautiful, reborn theme park in Disney California Adventure, I figured it would be worth a shot at staking my own place in the world of Disney-related photography. This was no guaranteed thing, because while I'd delved into web sites and hobbies before, I'd rarely followed through consistently and maintained regular updates on such activities. I even questioned how long this grand little experiment would last, but noted that surely, I could manage to do a "photo a day" (or even every couple of days) for a while. Well, a year later, and I've only missed one day total. 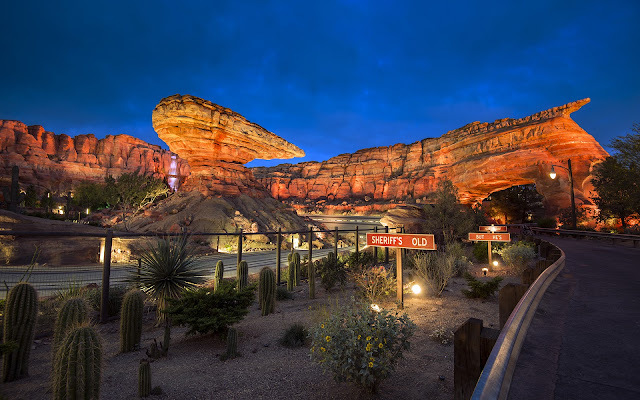 There have been 364 posts made, and hundreds of photos displayed, and somehow, Disney Photoblography has grown from a little hobby to something that actually has a bit of a following--albeit a small one, but a deeply appreciated one. And although I did hope that it could become something, I could have never expected this to be as successful as it has. It's just not the type of thing I would take for granted. So thank you to everyone who has followed this humble little blog of Disney park photography over the past year. Thank you to those who have expressed kind words to me, those who've shared links on Facebook or retweeted on Twitter or the surprising mass legion of followers I've gained on Instagram. It's all so incredibly flattering yet humbling at the same time, and I say that with great sincerity. But I'm never one to rest on my laurels, so I'm aiming higher and wider for this next year. This means hopefully more video projects, but definitely more locales, and of course more photos. Stay tuned. It should be fun. I know there are a lot of wonderful places on the internetz where you can find fantastic photos from Disney parks, so thank you for stopping here and making this one of them. 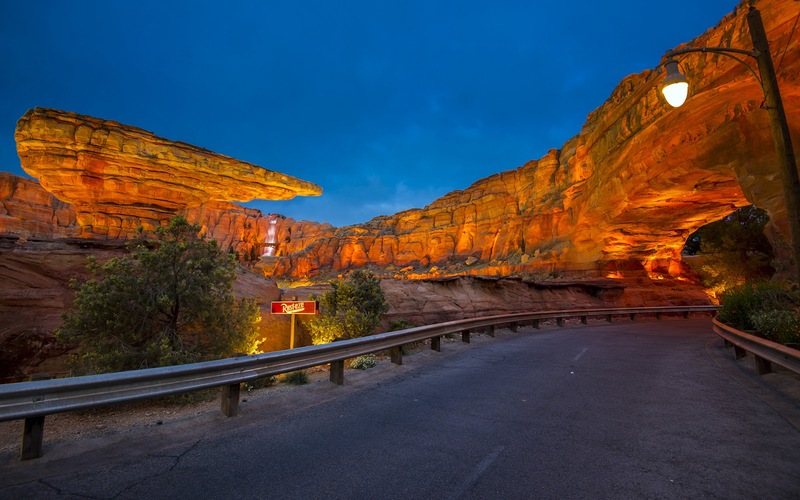 Radiator Springs Racers stands still, before sunrise, in the early morning light. Soon, Cars Land will be full of gleeful activity. But for now, all is calm. I figured that for the one year anniversary post, I ought to take it back to where it all began. Disney Photoblography's first ever post showcased the incredible Pacific Wharf entrance into Cars Land. So I think it's fitting that this year's post look back toward that vantagepoint. And if you want to be so generous as to celebrate Disney Photoblography's anniversary, it would be incredibly awesome if you shared this on your social media platforms, be it Facebook, Twitter, Pinterest, or anything else. Head over to the Facebook page and "like" Disney Photoblography! Follow Disney Photoblography on Instagram--most photos are repeats from what's featured on this site, but I'll also throw a few live photos from when I visit the parks. Leave comments too; I enjoy the feedback, and you can even throw in requests that I'll try to accomodate. So keep doing what you do, and I'll do the same on my end! Thanks! A little late, but happy anniversary! I love all things Disney; it is my childhood, so thank you so much for your visually stunning blog. I will be in Cali in August, can't wait for the parks!! Thank you very much, Eri! Hope you have a fantastic time here in a couple of months. Glad I could bring a little magic in the mean time.